Sailing and handling of the CATRI is not much different from that of a conventional trimaran. In other words it is like sailing a monohull with stabiliser wheels. It points well, it tacks well but it doesn't heel much. 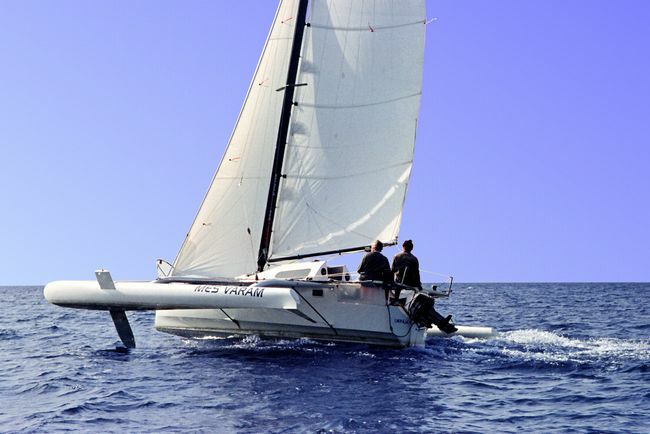 While the hydrofoils add very considerably to performance and safety, they do not add substantially to the complexity of sailing...if you can sail a Corsair or Dragonfly, you can sail a CATRI! Its high stability and orientation to shorthanded sailing make the CATRI a good choice, even for the inexperienced sailor. Auxiliary propulsion is provided by an outboard fastened to the rudder, which can be lifted together with it or separately. This solution provides better manoeuvring possibilities, especially at slow speeds. The 12V electrical system comprises cabin and toilet illumination, navigation lights, battery and switchboard. The battery is charged from the outboard alternator or through a charger from a shore power line. Basic to the CATRI concept has been the detailed and complex analysis and minimisation of loads and stresses within the boat structure, combined with a programme of materials and structural testing to provide maximum strength and durability. Combined with many years of experience in constructing high-tech multihulls, this ensures an exceptionally high quality product which will last for many years. Hulls and bulkheads are built in a light sandwich construction comprising 2 layers of polyester with PVC foam of 10 - 15 mm thickness. This construction is lighter than water and therefore makes the trimaran unsinkable. As an extra safety measure, all hulls feature a crash compartment. The crossbeam and the foils have a special “X” beam inside and unidirectional fibreglass reinforcement. The Catri is equipped with fittings from suppliers with high reputations, such as Harken. Teak or mahogany finish is standard. Carbon wingmast & boom is also standard. The increased width of the trimaran and loads from hydrofoils require special attention to overall durability. To assure the safety of this trimaran under any conditions, we have introduced three levels of durability control for the construction elements. First of all the material samples are tested. All crossbeams, foils and masts are tested before assembly. And finally the prototype of any new model is tested under extremely demanding conditions. The CATRI is an ideal cruiser or racer, utilising 21st century technology to achieve new levels of performance and safety at a reasonable price!